The new CONIFACE process, based on standard cutting tools and standard bevel gear machines, results in short cutting times comparable to straight CONIFLEX bevel gears. According to the traditional definition, face gears are plane ring gears with a face angle of 90° that mate with a spur or helical pinion. Such a face gear pair transmits motion and torque between two shafts that intersect at an angle of 90° (Figure 1). 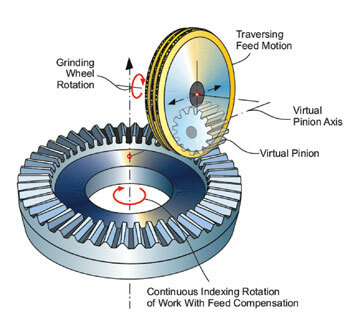 The axes of the pinion and gear intersect or cross under a certain distance (hypoid offset). Today there is a common expanded definition of face gears that covers all angular transmissions, where a “special ring gear” meshes with a cylindrical pinion in a non-parallel axis arrangement. This definition also presents the separation to bevel gears on the one hand, and to beveled cylindrical gears on the other. Although it appears to be an anachronism at first, it must be pointed out that in every angular transmission that consists of a true cylindrical pinion and a gear that results from the roll conditions with that pinion, the gear has a very typical flank form with a surface characteristic that is influenced only by the pinion and the shaft angle . 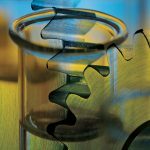 The complexity of manufacturing face gears is based solely on the fact that no simple generating gear can be found. 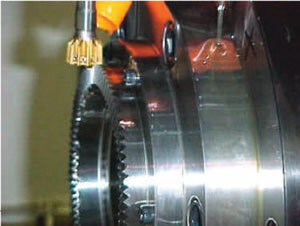 The generating gear of each face gear is always the mating cylindrical pinion. 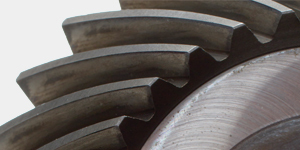 A pinion with only one more tooth, or a slightly changed addendum modification, cannot roll correctly with the same face gear. This leads to face gear manufacturing methods that are based on the principle of a generating cylindrical pinion. The special tool geometries of those methods are derived from the individual spur or helical pinion, which should mate with the manufactured face gear. 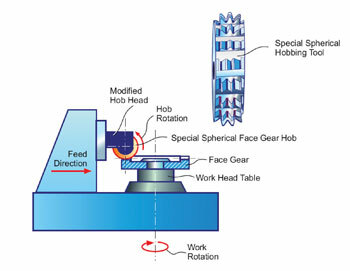 Figure 2 shows a modified cylindrical gear hobbing machine that employs a special hob for face gears (shown enlarged on the right side). One hob start winds about two times around the disk-shaped cutter body, where the cutter body is curved in width-wise direction (in the axial plane). The individual hob blades, which have an involute profile, are grouped like the teeth of the corresponding cylindrical pinion around the pinion’s root cylinder. The disk cutter for face gears attempts to represent the corresponding cylindrical pinion, similar to the way a regular hob represents a generating rack. There are process-related distortions, some of which can be corrected. The cutter disk moves during the cutting process in the “feed direction” across the face width. Such a cutter disk can only be used for one particular face gear design, which makes standardization of the cutting tools impossible . A very elegant and geometrically sound cutting method for face gears uses a shaper cutter as shown in Figure 3. The blade profile of the shaper cutter is equal to the corresponding pinion profile, where backlash and root clearance have been considered in the design of the tool. The tool is a custom design, but it is calculated and manufactured like a regular shaper cutter. Hard finishing by continuous grinding with a threaded grinding wheel (Figure 4) is very fast, yet it requires the same corrections as already mentioned for the hobbing disk cutter. 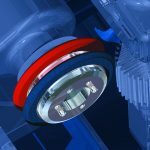 Dressing of the threaded grinding wheel is complicated because it requires a spatially inclined involute path, and it presents undercut conditions on the two sides of the threaded grinding disk. The single indexing generating grinding shown in Figure 5 delivers very precise flank forms. The profile of the peripheral grinding wheel resembles the normal tooth profile of the corresponding cylindrical pinion, where backlash and root clearance have been considered. 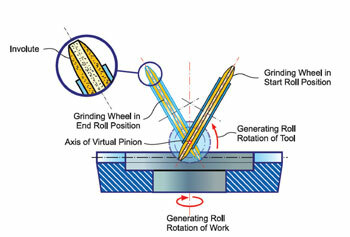 It is required that the grinding wheel traverses in each generating roll position along the entire face width. The discrete generating positions have to be chosen in increments fine enough, since there is no automatic process to support rounding of the generating flats. Both flanks of one slot can be ground simultaneously, which is advantageous regarding grinding time and grinding quality. 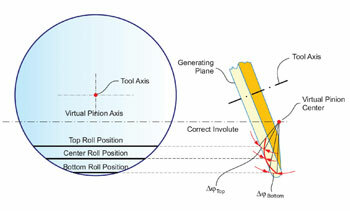 The generating motion is a swing rotation of the grinding wheel around the virtual axis of the corresponding cylindrical pinion, as is indicated in Figure 5. In spite of the simultaneous machining of both flanks of one slot, single index grinding is the slowest of the methods discussed so far. 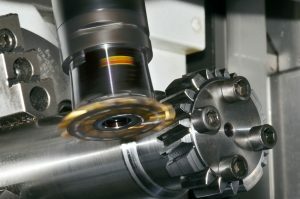 One question raised from this discussion: “Is there a universal tool that can be applied on an existing gear cutting or grinding machine design in order to simulate the involute shaped tooth of the corresponding cylindrical pinion during the machining process?” A simulation of the pinion tooth along the entire face within any roll position would be a great advantage because this could eliminate the time-consuming traversing motion, and at the same time it would provide a rounding between the generating flats. The contact lines between the cutter disk and the flank of the corresponding cylindrical pinion are drawn in the left part of Figure 6. These contact lines extend along the entire face width but they are different to the actual generating lines, which are identical to the contact lines between cylindrical pinion and face gear. An important aspect is the face width orientation of the contact lines between face gear flanks and enveloped tool surface, because it presents the possibility of eliminating any traversing feed motion. 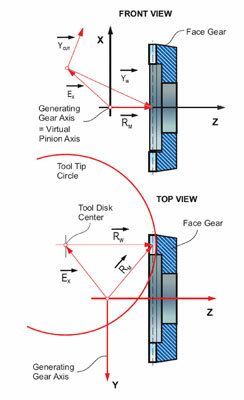 Figure 7 elaborates on the interaction between tool and face gear. In spite of the similarity with Figure 5, the relationships are fundamentally different. The tool disk in Figure 7 is tilted to match the pressure angle of the corresponding cylindrical pinion. The generating roll is indicated in Figure 7 beginning at the topland in a clockwise direction. In a first approximation the universal tool disk represents a plane that carries the generating profile (involute on a tangential plane). This is the reason why only one face of the tool disk can be utilized at one time to simulate one flank of the generating gear (corresponding cylindrical pinion) in order to form a face gear flank. This leads subsequently to a “two-cut process” that further underlines the analogy to the CONIFLEX process. 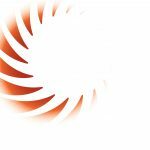 The required freedoms for the manufacturing of a face gear are present in every modern PHOENIX® bevel gear cutting or grinding machine. In view of the similarity between face gears and straight CONIFLEX bevel gears, the application of bevel gear machines seems to be a useful combination between process and machine tool. 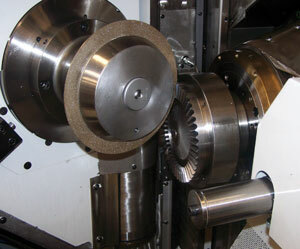 Bevel gear machines commonly use basic data for the part program calculation performed by the control computer. 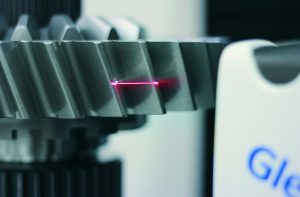 This led to the task of deriving basic settings for the manufacture of face gears, which are based to some extent on the similarity to the CONIFLEX straight bevel gear manufacturing process. The basic data defines the relationship between the tool and the generating axis, as well as the relationship between this generating axis and the work axis. 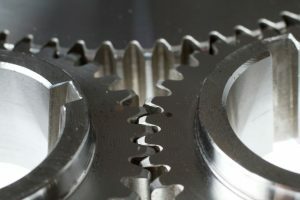 Not only is manufacturing a face gear possible with the data derived in the previous section, but a theoretical generation of surface points and tooth contact analysis can also be conducted previous to manufacturing in order to optimize the face gear transmission. The surface points are also available for coordinate measurements of the face gear flank surfaces. 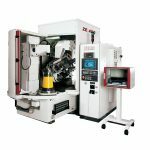 This mathematical foundation enables the calculation of corrections for the cutting or grinding machine after the 3-D measurement, which allows the correction of errors in spiral angle, pressure angle, tooth thickness, and tooth depth in the same way as is known for spiral bevel gears. 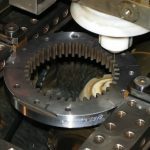 Length crowning can also be applied to face gear flanks by creating an internal cone of the cutter disk, like in the case of CONIFLEX straight bevel gears. Profile modifications are possible by a second order modification of the ratio of roll or simply by using blades with profile curvatures. A geometrical characteristic of the CONIFACE process is the curved root line, which is created by the peripheral cutter. 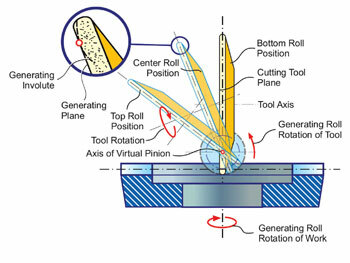 Figure 9 shows projections of the cutter outline in different roll positions. It is evident in Figure 9 that in different roll positions, different curved cutter paths are effective in generating the flank and forming the root line. This circumstance causes a nonlinear distortion of the involute blade profile as it generates the face gear flank. This has an influence on the contact geometry, as the two “Ease-Off” plots in Figure 10 show. Figure 10 is the result of a tooth contact analysis calculation between a cylindrical pinion and its mating face gear. 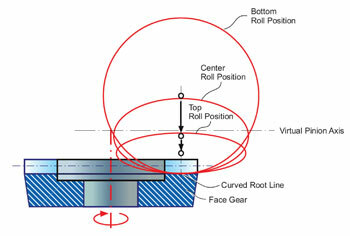 A flank pairing between a face gear and a cylindrical pinion that was designed to be conjugate has a “Zero Ease-Off.” In this case all ordinate values in the Ease-Off topography graphic are expected to be zero. The real Ease-Offs in Figure 10 show so-called “butterfly” surfaces instead. The amplitudes of the butterfly surfaces depend greatly on the diameter of the chosen cutter; they become smaller with an increasing cutter diameter. However, in all real applications an Ease-Off with length crowning and profile crowning is desired. 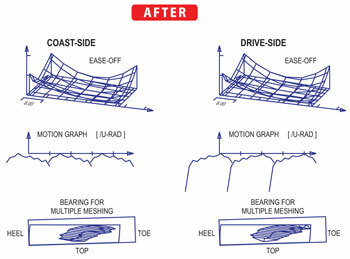 It is possible to modify the butterfly Ease-Off by applying several different flank correction techniques, which results in a rather typical bevel gear Ease-Off. 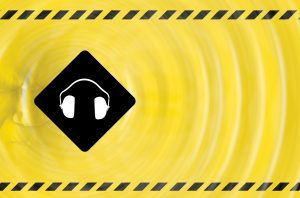 In addition to length and profile crowning, “Blended Toprem” and “Blended Flankrem” were applied to enhance the initial Ease-Off. 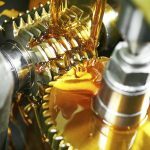 Blended Toprem removes the negative Ease-Off on the gear root ends, while Blended Flankrem reduces the highly positive corners on the gear top. The desired amount of length crowning can be achieved by a slight internal cone of the blade edge’s enveloping surface (versus a plane). The result is shown in Figure 11. The kinematic process as described is only suitable for straight tooth face gears or face gears with very small spiral angles. 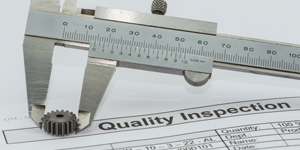 Soft cutting is conducted on standard PHOENIX bevel gear cutting machines based on a double summary. The first part of the summary describes the lower cutting position, and it includes all information for the roughing of the slot and the finishing of the first flank. 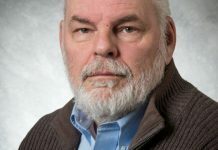 The second summary part includes the information for finishing the second flank in the upper position in the correct work axis phase relationship. Figure 12 shows the cutting of a face gear flank in the upper position. At first all flanks of the lower position are finish cut. After that the machine moves the cutter in the upper position and rotates the work in the correct angular position in order to cut the “second flanks” with the correct tooth thickness. Suitable cutting tools are CONIFLEX®Plus peripheral cutter heads with diameters of 4.25 inch, 9 inch, and 15 inch. 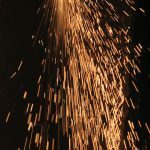 The blades are standard PENTAC® carbide blades, which can be ground or re-sharpened on standard Gleason blade grinders with the possibility to realize the required blade profile modifications. 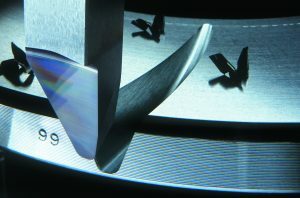 Soft manufacturing in high-speed dry cutting is possible with two- or three-face ground blades, with either front-face coating only or all-around coating. 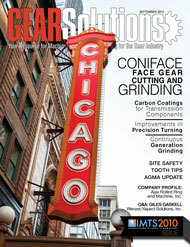 It is possible to hard finish face gears in a skiving process with all-around coated carbide blades. Cutting machines and cutter heads for skiving are identical to those used for the soft machining. Dry skiving is possible, but to achieve acceptable tool lives wet skiving is recommended. The alternative is grinding with electroplated coated CBN grinding wheels. 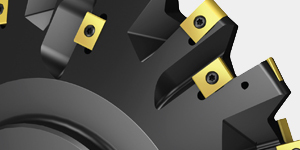 It is not possible to employ dressable grinding wheels since the grinding wheel profile required for face gears has to basically resemble the silhouette of the cutter head from soft cutting (undercut). It is recommended to grind only the flank surfaces and the transition to the root fillet (not the bottom of the root) in order to reduce the grinding wheel wear in the region of the outer circumferential wheel tip. 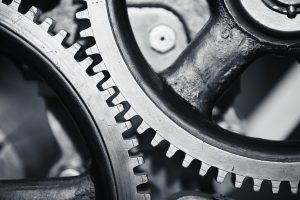 This is a well-established technology for industrial gears. 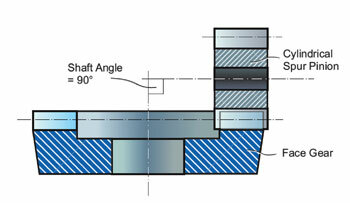 Figure 13 shows the CBN grinding wheel in the upper machining position engaged with the second face gear flank. Efficient machining methods for the manufacturing of face gears that employ universal tooling have not been available previously. The existing methods were either too slow or required complex and expensive tools. 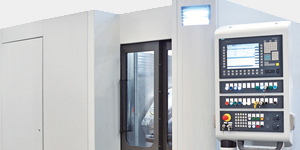 The new CONIFACE process is based on standard cutting tools and standard bevel gear machines. CONIFACE machines the slots in a single indexing mode in two steps. 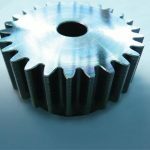 Cutting times are short and comparable with straight CONIFLEX bevel gears. CONIFACE software uses the geometrical data of the cylindrical pinion that should mate with the face gear. 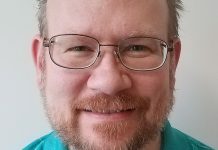 Optimization of the principle roll conditions—e.g. by optimization of the radial location of the face gear tooth width—are possible and should happen in the first step. The success of this optimization can be verified on the shape and location of the undercut lines. Figure 14 shows the undercut lines of an initial face gear (left graphic) and the optimized version in the right graphic of the figure. The active load transmitting flank surface area (above the undercut line) was enlarged by more than 20 percent as a result of the optimization. 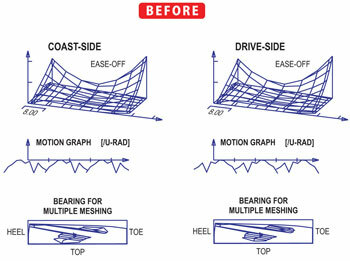 Ease-Off, tooth contact pattern, and motion error are optimized in a second step. Results of a tooth contact optimization have been shown in Figure 11 in comparison to Figure 10. 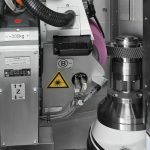 The CONIFACE program system provides summaries for blade grinding, cutting, and tooth grinding. 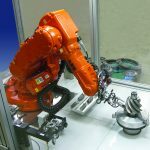 Furthermore, data for a coordinate measurement with following machine corrections are already tested possibilities that the CONIFACE system offers. 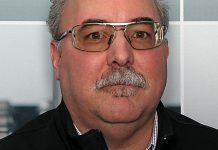 1) Basstein, G. New Developments in Design and Manufacturing of Face Gears. Sutstra, A. Antriebstechnik 32. Jg. 1999, Heft 11. 2) Stadtfeld, H.J. Face o Crown Gears Pederneschi, F. Organi Di Trasmissioni, Seite 74, Feb. 2000. 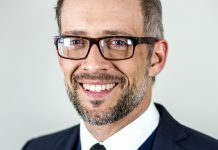 3) Stadtfeld, H.J. 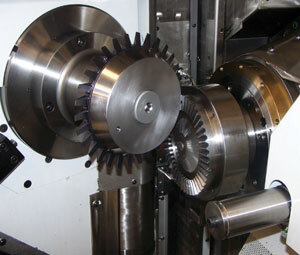 Straight Bevel Gear Cutting and Grinding on CNC Free Form Machines. AGMA No. 07FTM16, Oct. 2007, ISBN: 978-1-55589-920-2.